Happy New year to all you and yours: We had the most amazing past year, with so many incredible experiences around the globe… Possibly the best in Efterklang history. Thanks a lot to all of the people making each concert special, and to all of you showing us love one way or another! FREE SLARAFFENKLANG EP – MERRY CHRISTMAS! Please download and enjoy this free Live EP by Slaraffenklang! A mutant band of Efterklang and Slaraffenland. There are 4 songs on the EP and a front cover is included in the zip archive as well. In May 2008 Efterklang & Slaraffenland were on a joint US tour under the name The Danish Dynamite Tour. Halfway through the tour the bands got a call from back home. The newly established Sono Festival wanted to hear if Slaraffenland and Efterklang could be interested in performing a special concert at their festival. After a very quick talk on the topic it was decided that everyone would love to play in a band with two drummers and a lot of distorted guitars and therefore the offer was accepted. The 4 songs on this free live EP are all recorded at Sono Festival in Rødovre (a suburb to Copenhagen) November 8th 2008. This was the first and maybe also the last concert with Slaraffenklang. The idea is simple and fun. Slaraffenklang is the mutant band of Efterklang and Slaraffenland. There are 12 musicians on stage, all men, and the songs performed are covers of Efterklang and Slaraffenland. Sometimes just louder and more rumbling versions and sometimes in new slightly new arrangements. recorded, mixed and mastered by Petter Samuelsson. 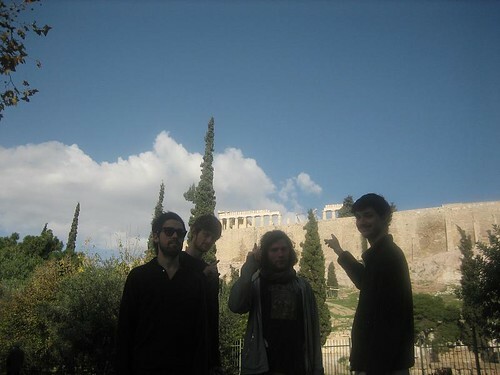 Photo Blog Updated – Thanks a lot Athens!!! Also, we want to send out a big thanks to the incredible audience at An Club, Athens, GR, for giving us such a nice “last show of the year”, despite of the horrible thing happening just outside! We’ll start looking into new songs now and prepare ourself for future adventures, so for the next months and during the winter we’ll stay at home in Copenhagen and empty our heads. THANKS ONCE AGAIN TO ALL OF YOU AMAZING PEOPLE SHOWING UP AT OUR CONCERTS AROUND THE GLOBE DURING THE LAST 14 MONTHS, AND TO ALL OF YOU SENDING US SWEET WORDS & THOUGHTS! IT’S BEEN MAGICAL, AND WE CAN’T WAIT TO SEE YOU AGAIN!!! It might be a little early for this kind of greeting, but for Efterklang the year ends tomorrow in Athens, Greece when we will play the very last concert of our Parades tour. In the last 14 months, the tour has taken us to North America, China, and almost every single country in Europe. 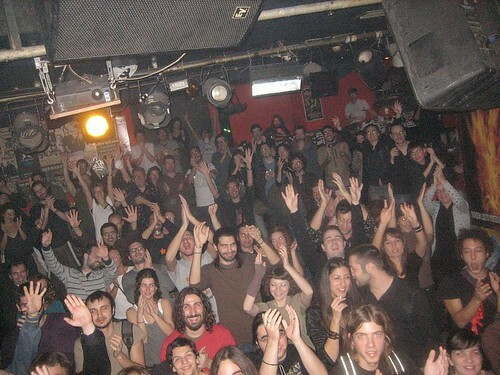 In total we have played 133 concerts since October 16th 2007. The entire list of concerts can be read below. We have documented most of our travels on our flickr photo page: http://www.flickr.com/photos/efterklang-recordings – There are more than 1000 photos to be flickered. It has been one of the best years ever for us, and we are now looking forward to future adventures and new Efterklang releases in 2009. We also look forward to upcoming albums by Slaraffenland and Taxi Taxi! which will be released on our label Rumraket in 2009. A thousand thanks (as we say in Danish) to everybody that somehow took part in this past year. We have experienced so many things and it is nice to have been able to share it with so many friends, musicians, collaborators and listeners! Pitchfork: Cutting Ice To Snow video in top 40 of the year! The notorious website Pitchfork has publicized their top 40 of Music Videos of 2008. We are proud and honored to see that the video directed by Jeremiah Zagar for our song Cutting Ice To Snow is among their favorites! Thank You Helsinki, Tallinn, Riga & Uppsala!!! Frederik plays guitar, sax and sings in our live band and he also writes and play brilliant music on his own. Tonight you can see him play live in Christania at Byens Lys. 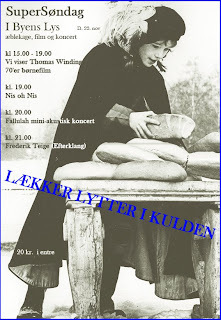 Lækker Lytter is hosting the afternoon/night which sounds like the perfect way to spend a Sunday in Copenhagen today. The play premiered this past weekend and we are so proud to be involved in this play! The story is great, the acting is superb and everybody in the Teater Grob team is incredible talented and incredible friendly. The play runs until December 13th 2008 at Plex in Copenhagen. Ticket and general info can be found here. Casper and I are DJ´ing tomorrow at Badmintonklubben residing at Isola at Nørreport, Copenhagen. Tonight is the night when we will join forces with our friends in Slaraffenland and for one night only we will perform together under the name Slaraffenklang. Slaraffenklang will play songs written by Slaraffenland and Efterklang in new arrangements and the rehearsals for this show have been a lot of fun! We look forward to play the concert! Catch this very special band at Viften in Rødovre, Denmark. The concert is part of the new SONO Festival. Wildbirds & Peacedrums are also on the bill and so is Ekko!